The Klondike Highway, labeled as Highway 2 in the Yukon Territory, connects Whitehorse, YT to Skagway, AK, running about 100 miles in the process. 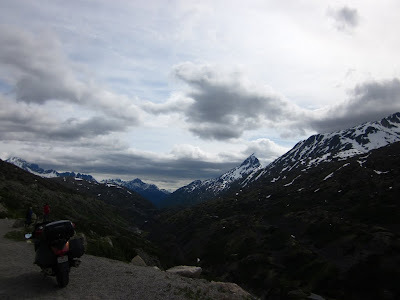 I had totally forgotten about Skagway, AK, but this afternoon it dawned on me that I could easily ride down there. In fact, this afternoon I had finally gotten a word from Mike. 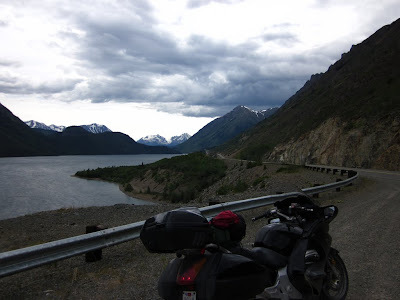 He and Paul had reached Deadhorse, AK, the furthest north on the Dalton Highway, the Arctic Ocean. Except when I got the word from him, he had already made it back to Fairbanks, AK. 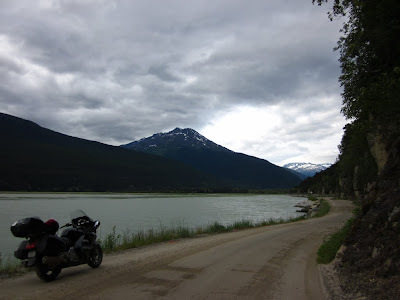 He and Paul were planning to head back to Canada, but do the Top of the World Highway into Dawson City, YT. So instead of riding further east on my own, I decided to kill some time and let them catch up to me in Whitehorse. So today, I decided to take this trip down to Skagway. But before doing so, I managed to hit up the local Wal-Mart in Whitehorse, and buy me a new digital camera. I also visited the local Honda dealer to pick up a bottle of antifreeze. My Honda ST seems to lose some coolant for several thousands of miles. The road to Skagway takes only about a couple of hours, which means I actually had plenty of time to remain in Whitehorse and visit the local brewery, Yukon Brewing. But their tour didn't start for another hour. So I rode my motorcycle around and found Yukon Harley-Davidson, the local dealer. I suppose being a former Harley rider, I still can't help noticing every dealer and licensed store I see. 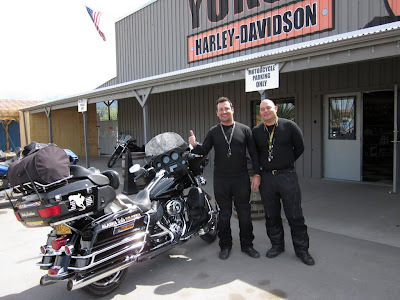 And Yukon H-D is no different from the hundreds of other Harley dealers, tons of t-shirts, logo-branded junk, and people who think they're just too cool. But I happened to meet a few riders from Colombia. They actually had their Ultra Classics shipped from Colombia to Key West, Florida. Then they hopped on them and rode them out this far. Their ultimate goal was Deadhorse, AK. 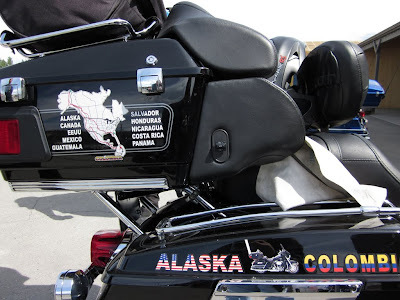 After that, they'd ride them down the Pacific Coast, through Mexico, Central America, and back into Colombia. I could barely understand their English, but somehow we all managed to understand each other. I actually figured out enough to learn that previously they had ridden their Suzuki V-Strom 1000s from Colombia to Argentina. I wanted to tell them that they should have brought those to Deadhorse, AK instead, but I was having a difficult time trying to talk to these guys as it was. Carlos and Carlos, both from Colombia, not pictured was a third guy, Julian. 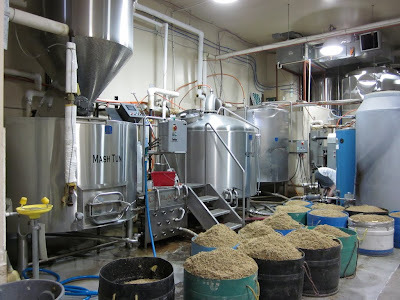 I got back to Yukon Brewing, and found the tour lasted only a measly 10 minutes. But at least they gave me tastings of every beer they made. 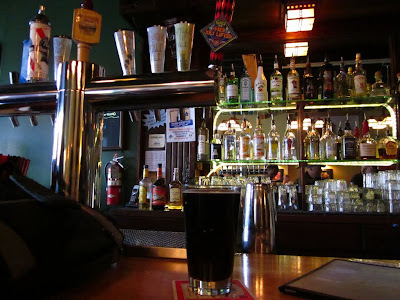 From what I could tell, their Yukon Red and Midnight Sun Espresso Stout were the best they had. Interestingly, a guy there said that Canadian IPAs are far less hoppy than American IPAs, and certainly Yukon Brewing's IPA tasted nothing like the IPAs I was used to in the States. It was almost like they forgot to add the hops altogether. After hanging out with them, I took off for Skagway. 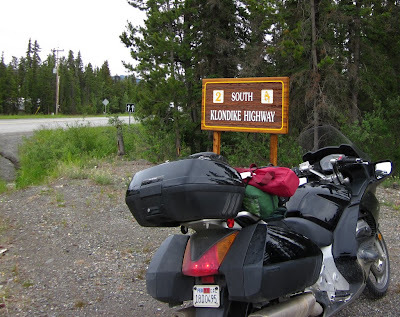 The Klondike Highway starts off like most other highways in Alaska and Yukon, lots of straight road with some very wide curves. It's quite boring riding. But as you get towards the mountains, the scenery becomes quite beautiful to look at. 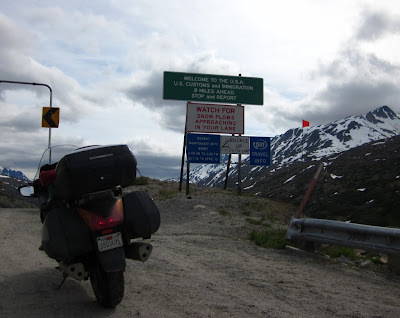 And when you reach the US/Canada border, it gets somewhat twisty, with some 30mph curves and a couple of switchbacks. Except you can't really enjoy the road because there's too many tour buses getting in the way. That's because Skagway is major destination for cruise ships. 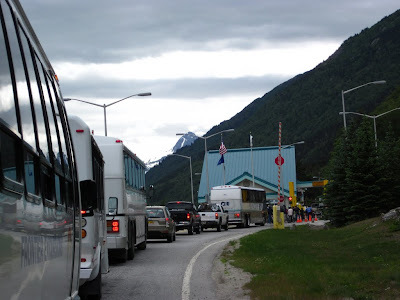 The cruise ships all offer side trips to Whitehorse and Dawson City, which is why the Klondike Highway is chock full of buses. 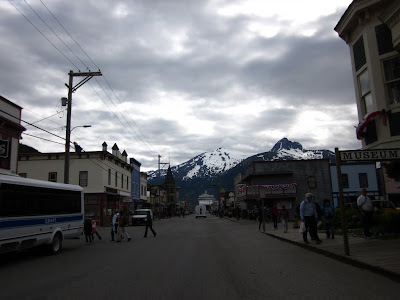 Skagway is a very touristy-looking town, with it's 1800s era gold mining theme. If you're familiar with San Diego County, imagine the town of Julian, but only 20 times larger. 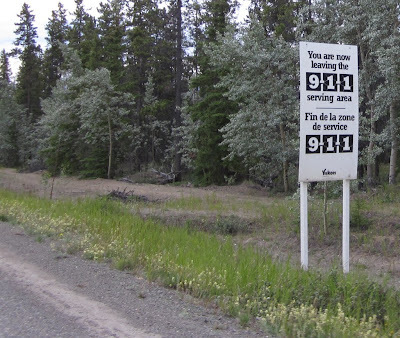 I actually got there around 6:00pm, and right away I wanted to find a campground to stay the night. I pulled into the National Parks Service visitor center, who recommended Dyea National Historic Park. Dyea used to be a town that served the Klondike Gold Rush of 1897, it's now long gone, except for a cemetery, a campground, and some roads the National Parks Service uses to run tours. The road to the campground is 3 miles of pavement, and then 5 miles of hard-packed dirt. I met the camp hosts, an elderly couple, who seemed very friendly and generous. After I pitched my tent at their campground I rode into Skagway to take in the local brews. Skagway Brewing was my first stop, and I had four of their brews, and found them all excellent, actually much better than Yukon Brewing, but then again I'm partial to American microbrews. Even their fish and chips were excellent. 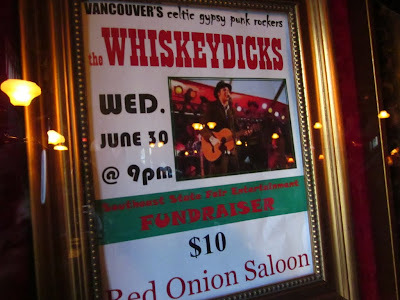 Then I stopped at the Red Onion Saloon, which was a brothel in its earlier days. By 8:00pm, the town seemingly became empty. The bartender at the Red Onion Saloon said that most cruise ships pull out of town around this time, and the town goes completely dead. But it comes back to life around 9:00pm, when the locals wander out. 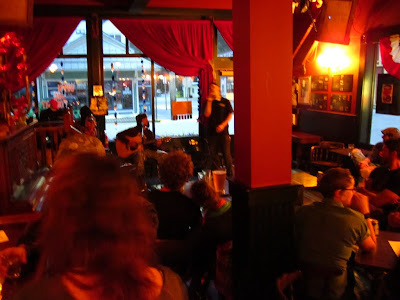 And sure enough, by about 10:00pm, the Red Onion Saloon was rocking. I asked the bartender if she knew of any places in Skagway with Wi-Fi. She said only the public library. Otherwise, internet access is way too expensive here. Even the Starbucks here doesn't offer it, and interestingly, the Starbucks closes at 7:00pm. 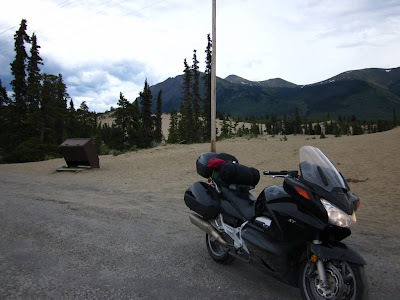 I finally left the Red Onion Saloon close to midnight, and managed to ride my motorcycle back to the campground. I found myself doing 30mph on the dirt road, whereas earlier in the evening I was only managing 20mph. I guess I had gotten used to it already. And guess what, as I sit here typing this blog entry, I can hear rain hitting my tent. 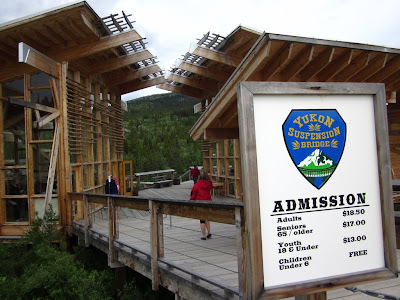 The Yukon Suspension Bridge is a pedestrian bridge over the Tutshi River. They wanted $18.50 to walk it, or see it. Pictured here is merely the gift shop. They have wooden fences put up so that you can't see the bridge from outside.